If you use a Content Management System (CMS) like Word Press or Joomla, you can add an AddressTwo contact form on your website. Place the I frame link text in the source of a page where you want the form to display. It's important to include a link in your campaign emails to give your contacts a way to engage with you. If you want to find contacts that opened a campaign email but did not click on a link, you can create a list. Then put all the contacts that viewed the email on the list and then remove the contacts that clicked a link. You will be left with a list of all the contacts the viewed the email, but did not click a link. Follow these steps to create a list of contacts that opened an email but did not click on a link. 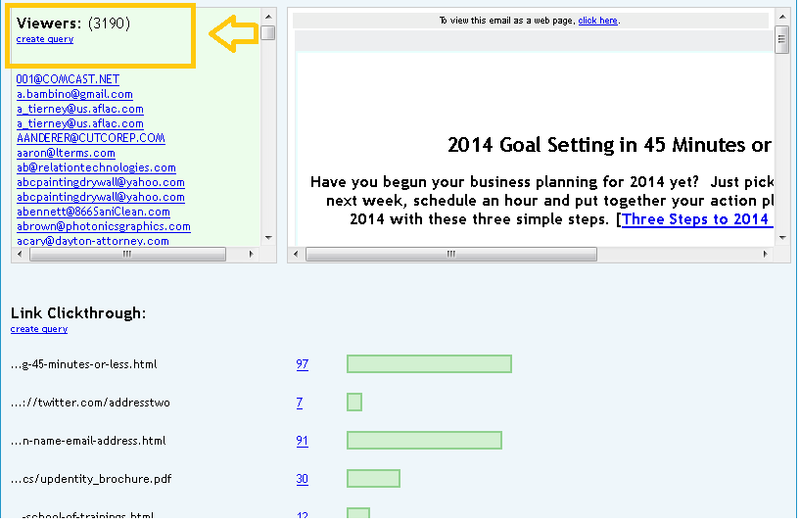 Step 2- Pull up Email results under Campaigns, Manage, Sent , View Report. 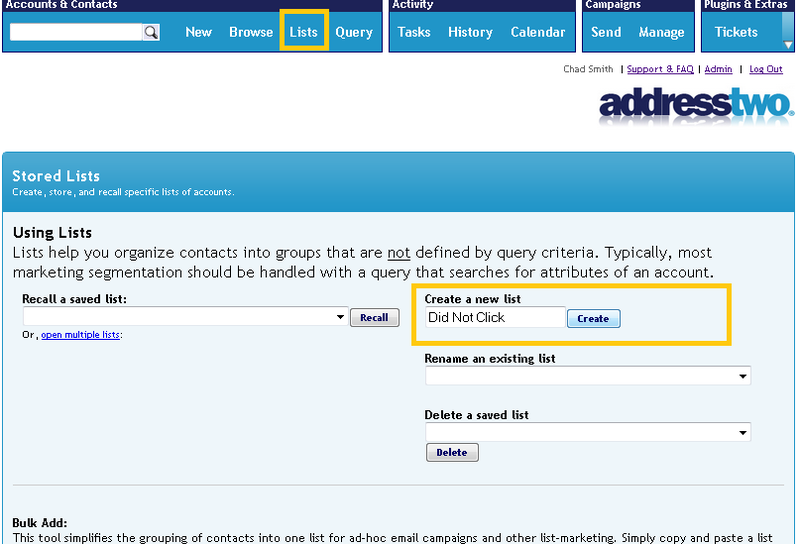 Step 3-Find the contacts that have viewed the email and click create query. 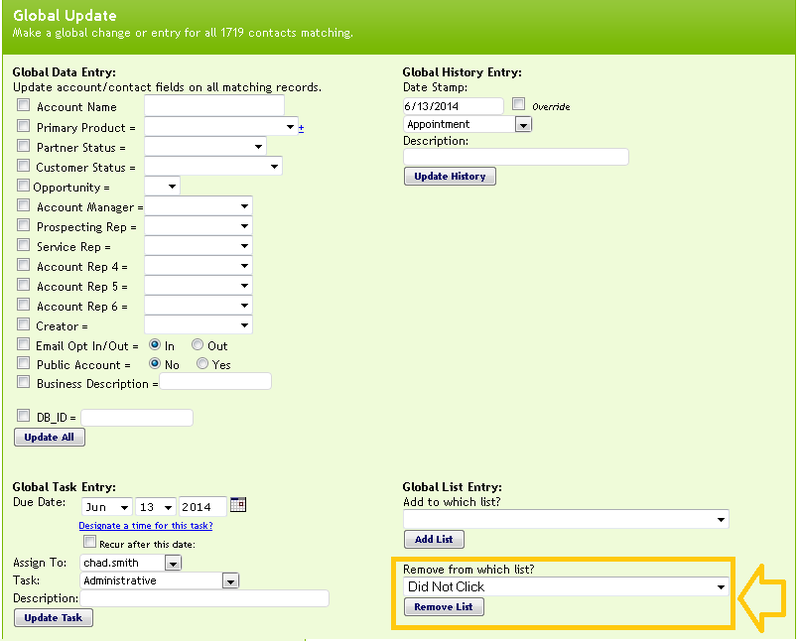 Step 4-On the query results,use the 'Use this list' drop down and choose Global Update. Step 5-Add the viewers to the 'Did not Click' list with the' Add To List' section of the Global update screen. Step 6-Go back to the Manage, Sent, View report. 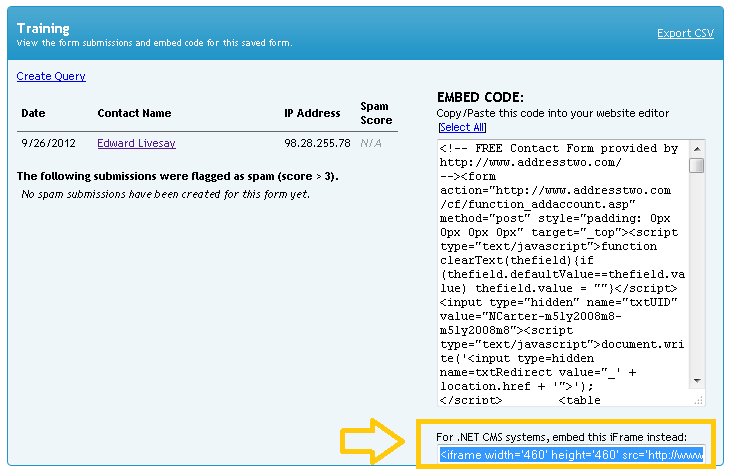 Step 7 Locate the contacts that clicked a link and use the 'Create Query ' link. 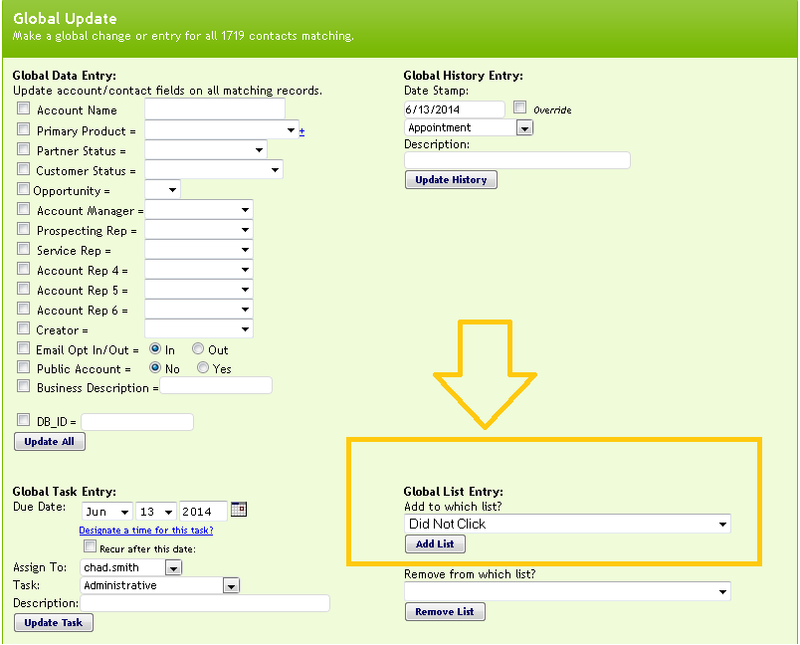 Step 8-On the query results, use the 'Use this list' drop down and choose Global Update. Step 10 Recall the 'Did Not Click' From the Lists. You can add new users under Admin, User Logins. The Username you selected already exists. Please click your browser BACK button and try again. The user name you are trying to add may exist in another Address Two account. User names must be unique from all Address Two user names. Please use a different username. You can assign permissions to users to restrict the capabilities of each user. Administrators are the highest level of permission and can see and do everything in AddressTwo. Super users can see all contacts but cannot make changes to administrative settings. Managers can be assigned sub users under the 'Assign sub users' link by their user name. There is a link to the abreviated permission list under the link called 'guide' under user permission. Once you add your new users you can send them their user name and password, or they can request their user name and password in an email with the forgot password tool. On the main screen by the login form at the top, click the (forgot?) link. This will let you put in an email address, and the user name and password will be sent to the user with that email address.